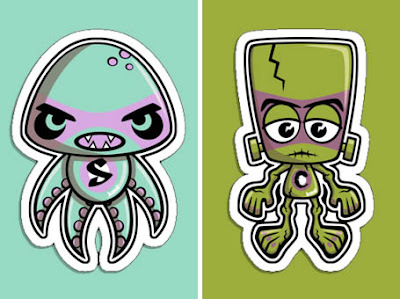 KawaiiPunk - Kawaii Mascot Blog: New Creeps on the Block! Yip, that’s right, it’s two brand new KawaiiPunk kawaii mascots especially recruited for your Halloween needs - the Swamp Mascot and the Creature Mascot! You can pick up these two reprobates on stickers, cards, clothing and gifts from our Zazzle, CafePress, and RedBubble stores! Or… if these two ain’t floating your Halloween boat then why not give the Demon, Ghost, Mummy, Monster, or Skull mascots a try. Or even the Clown Mascot - after all, he ain’t no rose garden to look at! Well, what are you waiting for? Get going, and get shopping!